Dental laser therapy gives us at Bradshaw Family Dental a less invasive, more comfortable option to treat our patients. Oral health is something that we take very seriously and anytime that new dental technology proves to increase the health of our patients, we are happy to adopt it. But what is dental laser technology and how can it help you? Dental lasers have been around for about 25 years now. Although not technically new, it’s still a technology that is in its infancy and has yet to be adopted by the dental industry as a whole. 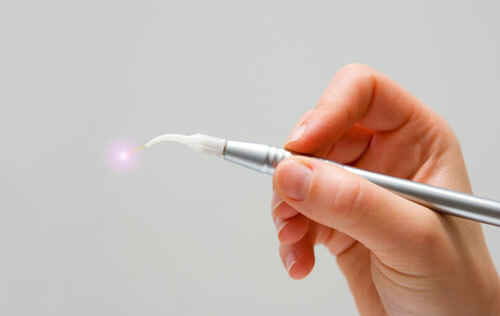 At first, dental lasers were only used in the soft tissues of the mouth to treat gums and perform high precision work. The thing that always made dental laser treatment stand out was its unmatched ability to provide patients with comfort and quicker post-surgery healing. It even allows us to use less anesthetic. Today we have two distinct varieties of dental lasers – those that treat hard tissue like bone and teeth, and those that treat soft tissue like gums. The major advantages noted above (quick healing and low irritation) remain a staple of the dental laser today. We are able to ensure the preservation of healthier teeth, bone and gum structures than if we were to use traditional treatment methods. When oral health begins to wane it is common for signs of gum disease to make their way into your mouth. Gums that bleed easily with brushing or flossing and red, irritated gums are the biggest signs of gum disease. When it reaches a point that the disease can’t be treated with at-home oral care it may be necessary to treat the gums with a soft tissue dental laser. We are now able to use dental lasers to aid in cavity detection. Before we had to rely on tactile feel, sight, and X-rays. Now we can simply use a dental laser to highlight cavities. We can even use lasers to treat sensitive teeth! We are always trying to find safe, effective, and ingenuitive ways to treat our patients to the very best in dentistry. We are pleased to see your happy, healthy smile! No matter what kind of treatment you receive, rest assured that we will provide you with comprehensive care and recovery instructions. Please call us today at (928) 277-0076 to schedule an appointment. Remember, if you experience red, swollen, or gums that bleed easily call us to schedule an appointment as this could be the sign of a more serious condition.